A parallelogram, with dimensions in cm, is shown below. What is the perimeter of the parallelogram, in cm? Our third angle is and we have a triangle. where is the length of the base and is the length of the edge. Opposite sides of a parallelogram have the same length. Therefore, both edges are and both bases are . where is the length of the longer side and is the length of the shorter side. ABCD is a parallelogram. BD = 5. The angles of triangle ABD are all equal. What is the perimeter of the parallelogram? If all of the angles in triangle ABD are equal and line BD divides the parallelogram, then all angles in triangle BDC must be equal as well. We now have two equilateral triangles, so all sides of the triangles will be equal. All sides therefore equal 5. 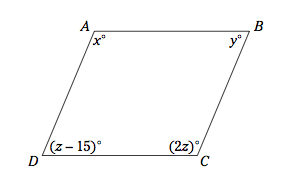 In the parallellogram, what is the value of ? Opposite angles are equal, and adjacent angles must sum to 180. What is the area of a parallelogram with a base of and a height of ? To solve this question you must know the formula for the area of a parallelogram. In this equation, is the length of the base and is the length of the height. We can plug in the side length for both base and height, as given in the question. Perform the multiplication to arrive at the answer of . Cannot be determined from the given information. where is the length of the base and is the length of the height. , where is the side opposite the . , where is the length of the height.